AT&T Inc. is a multinational telecommunications company headquartered in Dallas, Texas. Alongside Verizon Communications, it is one of the largest telecommunications operators in the United States. In 2018, the company generated 170.76 billion U.S. dollars in revenue. In 2018, the company employed approximately 268 thousand people and had over 150 million connections across its wireless service. Starting life as Southwestern Bell Corporation, following the breakup of the AT&T Corporation monopoly in 1983, the company later renamed itself to SBC Communications Inc. In 2005, SBC purchased its former parent, AT&T Corp., taking on both its name and branding. Within the U.S. wireless segment, AT&T and Verizon continue to fight for top spot, both sitting comfortably above Sprint Corporation and T-Mobile US in terms of revenue. AT&T has a subscriber base of approximately 76.89 million postpaid and 17 million prepaid customers as of 2018, and AT&T's monthly postpaid churn rate remains one of the lowest in the industry, sitting at just 1.12 percent in 2018. In terms of monthly average revenue per user (ARPU), AT&T generates almost 50 U.S. dollars per postpaid user per month. 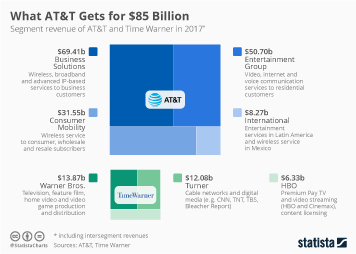 In 2018, the brand value of AT&T was estimated to be around 107 billion U.S. dollars, making it one of the most valuable telecommunications brands in the world.